The Minaret of Jam stands as a silent sentinel over the rocky valley. To its right and up the hillside, the ruins of the ancient village of Jam lie sprawled, pocked and pillaged, a prairie dog's dream town. Once, long ago, a proud sultan named "Muizdine of Mohammed ibn Sam" reigned as emperor from this very site. Now both the empire and the village are gone; yet the Minaret of Jam remains: a lonely watchtower, the proud talisman of a short-lived empire. A large shadow flits overhead; the buzz of the engine identifies it as an airplane. Inside, nine faces glue themselves to the windows, staring down at the minaret. It's a King Air, carrying Dudley, his son and grandson, plus six other men, Afghan and expatriates. Dudley Woodberry served for years as Dean Emeritus and Professor of Islamic Studies at Fuller School of Intercultural Studies in Pasadena, California. In 1973, however, Dudley was working in Rawalpindi, Pakistan. 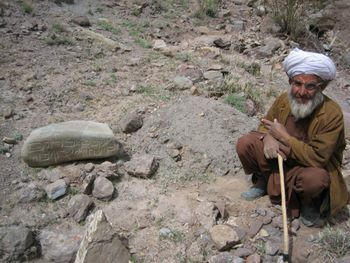 At that time he learned that an ancient minaret stood in a hidden valley in central Afghanistan. The Minaret of Jam's existence had only been announced by the governor of Herat in 1943, but the news had not reached Kabul until 1957. 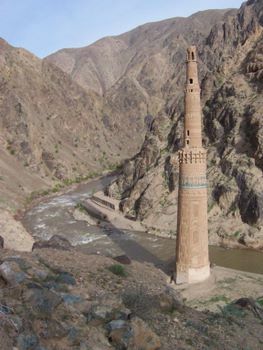 The minaret is now labeled the FIRST UN World Heritage Site of Afghanistan, and is considered to be THE most inaccessible of World Heritage sites in the world. 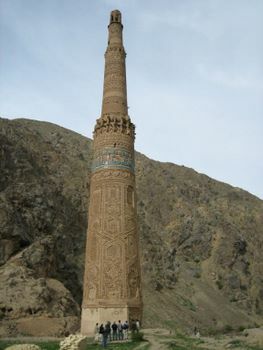 The Minaret of Jam was built during the short-lived Ghorid Empire (1148-1202). 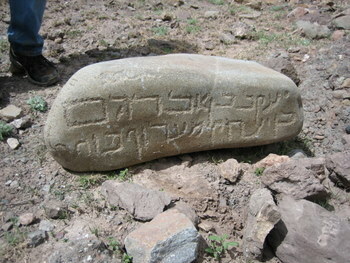 There is evidence that Christians still lived in the vicinity during Ghorid times, and also a Jewish graveyard testifies to a Jewish presence. 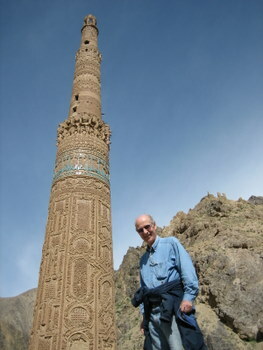 Normally a minaret is a tower on a mosque, but since there is no evidence of a mosque ever existing near to the Minaret of Jam, Dr. Woodberry believes the structure to have been a victory tower. There is a similar victory tower in Delhi, India, 25 feet higher than the Minaret of Jam. The one in Delhi is believed to be a copy of the Jam minaret. These historical facts were enough to ignite Dr. Woodberry's curiosity, however what fomented his decision to go was due to a report by author, Nancy Hatch Dupree, that the 19th sura of the Koran was etched around the base of the Minaret of Jam. This particular sura mentions the birth of John the Baptist, Jesus, as well as Isaac, Jacob, and other key biblical figures. Also inscribed is the phrase, "Muizdine of Mohammed ibn Sam: Sultan, king of kings." Professor Woodberry set plans in motion to journey to the Minaret of Jam. Two expatriates on staff at a school in Kabul also decided to join him. One was a teacher, and the other the principal. Woodberry asked them to arrange a vehicle and driver. The day finally arrived. Dudley, along with his nine-year old son, flew up to Kabul with high hopes. Their spirits fell when they discovered no vehicle had been procured. The one decrepit conveyance available to rent on short notice had no emergency brake, lacked sufficient brake fluid in the standard brakes, and the brake linings were shot. The short little driver who came with it slid down under the dash every time he needed to floor the feeble brake. 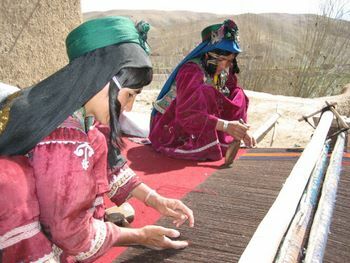 The group considered flying to Chaghcharan, then hiring horses. But a severe drought in that province argued against this proposal. They visualized capture by hungry, amateur bandits, intent on the food in the foreigners' packs. So they departed in the rattletrap of a rig. After only two hour’s drive, they realized the driver had missed a turn. They retraced their route, only for the car to blow a tire. Their only spare was little better than an inner tube. The men, however, doggedly pressed on. Presently they approached a stream whose bridge had washed out. Dudley and his companions understood the effect water would have on the already compromised brake linings, and counseled the driver to take the crossing gently. Yet, perhaps mistrusting their judgment, the driver pressed the accelerator, plunging through the stream and up the other bank. Soon the road began to zigzag up an escarpment with hairpin turns. Dudley noticed that truck drivers sharing the road all had something along to wedge behind their wheels when they had to stop. Their own vehicle lacked this simple piece of equipment. At one of the turns it became apparent their rig would not make it. As the vehicle began to roll backwards, the driver stretched under the dash to reach the brake. Dudley opened his door, pushed his son out and jumped out after him. A quick glance told him his two academic friends had safely bailed out. But so had the driver! Fortunately, one of the men managed nimbly to slip a rock under the back wheel. The wheel rested a mere two to three feet from the edge. Now a huge question confronted them. Who should ease into the vehicle and drive it a safe distance from the edge? No one trusted the little driver. They argued against Dudley’s assuming the task for fear Dudley’s nine year-old son might see his dad slide off the cliff. One of the teachers volunteered. The others placed rocks behind the wheels, and then pushed from the sides. Thankfully, man and car moved safely away from the cliff. At this point they proceeded up the road to Lal and spent the night at a medical clinic. The following day the group voted whether or not to turn back. Only Dudley wished to continue on to the Minaret. On the return they visited Band-i-Amir ("The Dam of the King"), with its mystical and milky, emerald waters, and then Bamiyan, where one of their number became very sick. Fortunately, Bamiyan hosts an airstrip, so he returned to Kabul by plane, the rest continuing overland. It would be 29 years before Dr. Woodberry was able to lay eyes on the Minaret of Jam. Dudley's wife, Roberta, arranged an air charter for him to fly over it. In February of 2004, the group presented themselves at the airport. But just as they were preparing to board the plane, the air operator received a call for a medical evacuation flight. It turned out to not be a medical emergency, but in the interim it became too late in the day to perform the Woodberry charter. Roberta was able to reschedule the flight to Jam later in the year. Two friends accompanied the Woodberrys in order to take videos and pictures. They circled the Minaret several times, and then flew over Band-i Amir and Lal. April 2006: The Dream Fulfilled! That might have been the end of the dream if Dudley's son had not been able to plan the trip having worked in Afghanistan for some years. By now it was 2006, and Dudley and Roberta were planning a trip to China. Their son formulated plans for a side trip! Dudley’s son had recently come to a juncture in his career, having accepted appointment to a new management position. The new job necessitated his transfer to the U.S. in April of 2006. 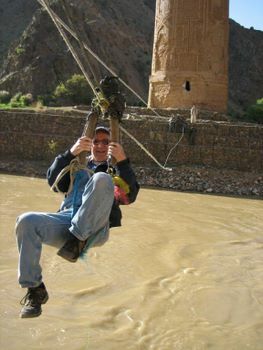 What better way to culminate his time in Afghanistan than by taking an expedition to the Minaret of Jam? They would fly by King Air to Chaghcharan. Contacts in Chaghcharan promised ground transportation from there to Jam. On April 5th, the dream became a reality. While quite a number of people wished to accompany the Woodberry men to Jam, only nine were fortunate enough to make the trip. Their pilots flew the plane over the fascinating Bandi-Amir lakes, still locked in ice. Then they surprised Dudley by diverting to a little valley lying south-southwest of Chaghcharan. 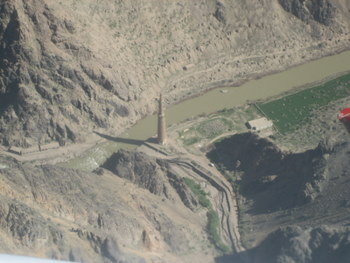 The plane circled low, providing a spectacular overhead view of the elusive Minaret of Jam. The crew then flew the plane back to Chagcharan, and as pre-arranged, a tourist company met them with two very road-worthy jeeps. They waved to the departing crew of the King Air, loaded up the jeeps, and set off for Jam! It was springtime in the hills of Afghanistan. Bright, rain-washed pasture lands glistened green against the background earth tones of the surrounding, rocky mountains. Here and there the travelers passed people picnicking along the roadside. As the road ascended, grassy areas shrank in size until rocky crags and scrub bushes took over, crowding up to the road. 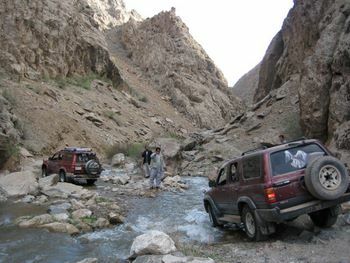 Several times the sturdy jeeps crossed muddy, spring-fed mountain streams. How good it was to have trustworthy wheels! Approximately seven and a half hours after departing Chagcharan, the two car caravan rounded a turn and stopped. A rushing mountain river tumbled alongside the road. On the far bank stood a 213 foot tower, engraved with geometric artwork and Arabic writing. They had arrived at the Minaret of Jam! They faced a slight dilemma, however: there wasno bridge, and one glance told them the river was too deep to ford. 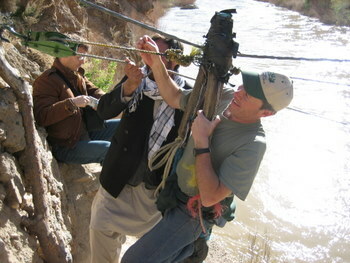 Closer inspection revealed a steel cable, a set of ropes and a pulley suspended across the river. All it had was a rope sling hung from the cable, and a reversed, wooden "V" frame served for handle grips. One by one the adventurers set their feet in the rope sling, grabbed the wooden handles, and launched themselves across the intervening space. The last few to cross did so by moonlight. 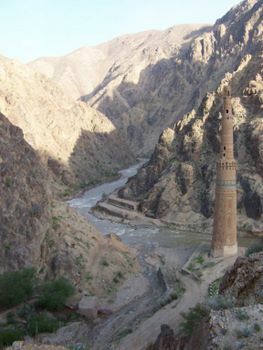 After an Afghan meal and a night's rest at the nearby guest lodging, the expedition was ready to study and explore the Jam minaret. Due to its proximity to the river, and the already marked "lean" of the minaret, Unesco had built a retaining wall and reinforced the base of the tower. Mud brick comprised the predominant construction material in the nearby village of Jam. But unlike the morass of disintegrating rubble in the nearby village, the 813 year-old minaret of Jam was in amazingly good condition. The Ghorid emperor who had ordered the construction of this victory tower had chosen quality fired bricks for the main construction material, then reinforced it with wooden beams. Ghengis Khan supposedly swept through the area during his expansion of the Mongol Empire into Central Asia (1216-1221, see Encarta 2005). He reportedly trashed the city, but left the minaret untouched. As in the case of the Buddhas of Bamiyan, Ghengis Khan seemed to have had an almost superstitious respect for artifacts of religious value. 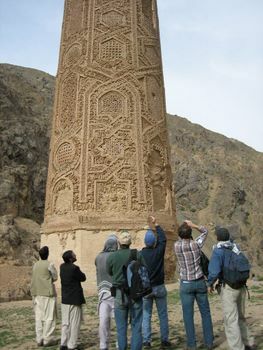 The minaret's architects had etched designs in the bricks, reminiscent of the Moorish artistry of the Spanish Alhambra. They wove "Kufic" writings around the designs, also making a collar of blue "Kufic" writing two thirds of the way up the tower. "Kufic" writing is a style of Arabic developed in southern Iraq. The city of Kufa, situated at the top of the Persian Gulf, was a center of Koranic learning. Dr. Woodberry snapped many pictures of the minaret in hopes of translating the writing. Although Nancy Hatch Dupree claims the Kufic writings are the 19th sura of the Koran, the guard/guesthouse manager of the minaret claimed the writings were from eight different suras of the Koran, fifty verses from each. Dr. Woodberry hopes to verify who is correct. 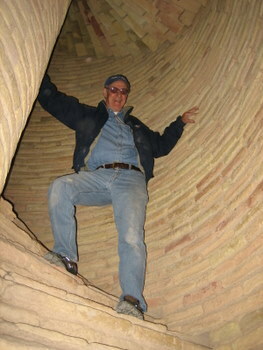 After a thorough study of the exterior of the minaret, the men decided to explore the interior. Two winding staircases spiral up the center. Toward the top, the visitor must cross a six-inch thick slab of rock that acts like a bridge. The staircase continues upward from the opposite side of the rock. A brick dome supports the rock from underneath. 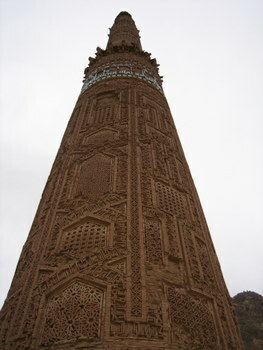 The diameter of the Minaret of Jam narrows as one approaches the peak, the tilt of the tower becoming more pronounced. The tilt is quite uncomfortable. A few from the group continued all the way up, ignoring the sideways pull of gravity. After exploring the interior of the minaret, the group descended, and then headed up the road to find the Jewish cemetery reported to be in the vicinity. They finally found it after speaking with an old man from a nearby village. The cemetery has suffered archeological theft, but the old man guarded the secret location of a headstone that had tumbled down a hill, some distance from the cemetery. Crudely etched Hebrew letters were still clearly legible. The first line reads, "Jacob son of Abraham.” Line two continues with, “son of Isaac..."
The Woodberry "Minaret of Jam Expedition" was clearly a success. Future adventurers, however, might want to head out sooner rather than later, unless that frayed rope spanning the river is replaced! Or perhaps the next group can bring their own rope, ...or even an inflatable raft!